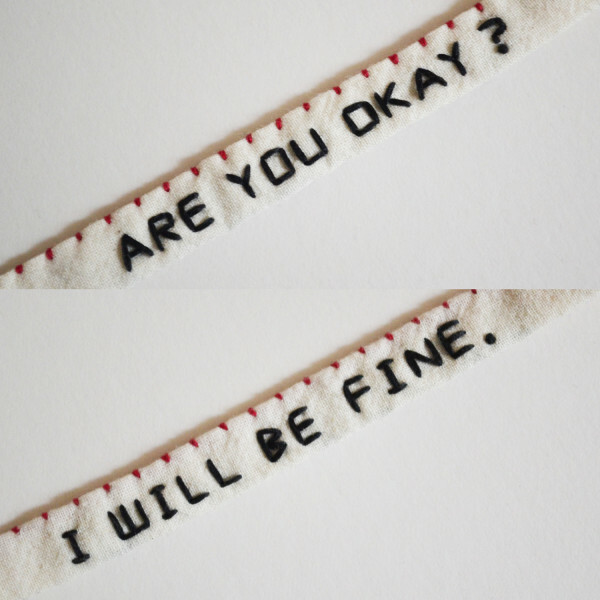 Here are some sweet/sad crocheted bracelets I’ve made using plastic alphabet beads. 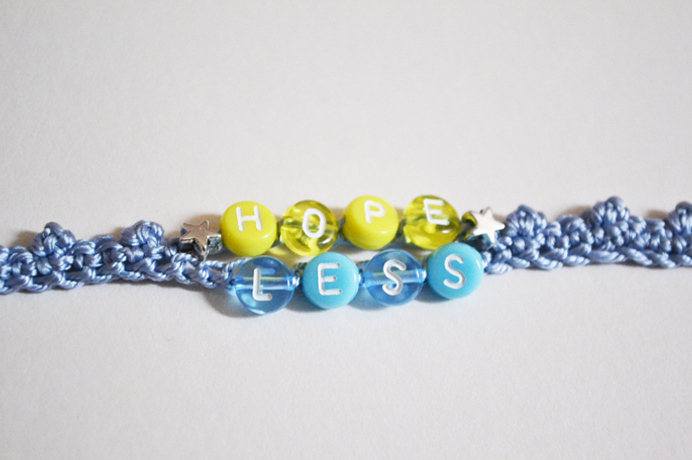 The alphabet beads are arranged in two rows dividing the word “HOPE/LESS” between two silver coloured star-shaped beads. I have made several styles using various combinations of coloured beads and cream or baby blue coloured silk yarn. I might make some with baby pink yarn later. 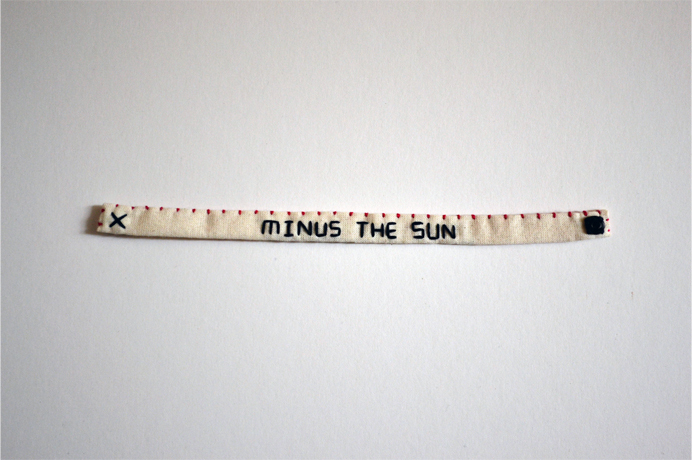 Round metal tags stamped with “Minus Sun” are attached. 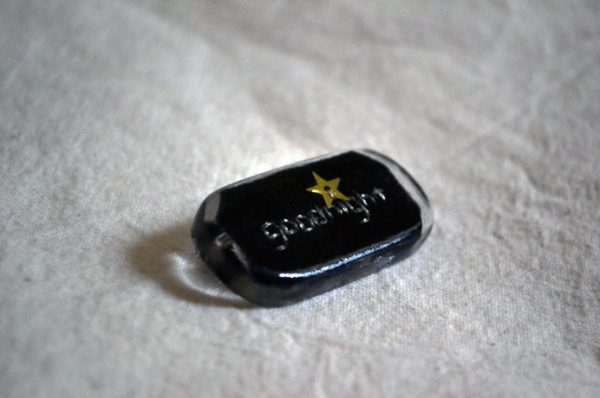 Those are stamped one by one by myself with a hammer. 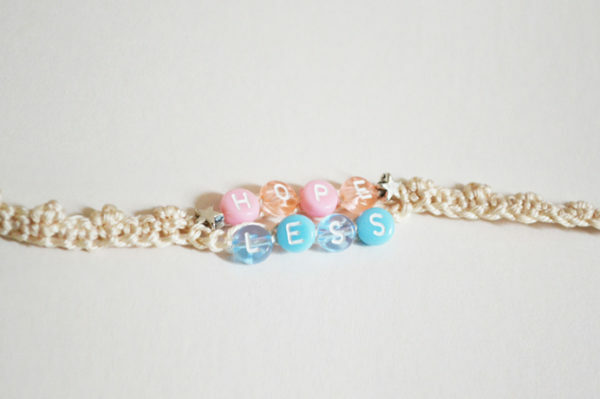 I like the sweet, childish, and nostalgic atmosphere of the alphabet beads combined with this downhearted word. 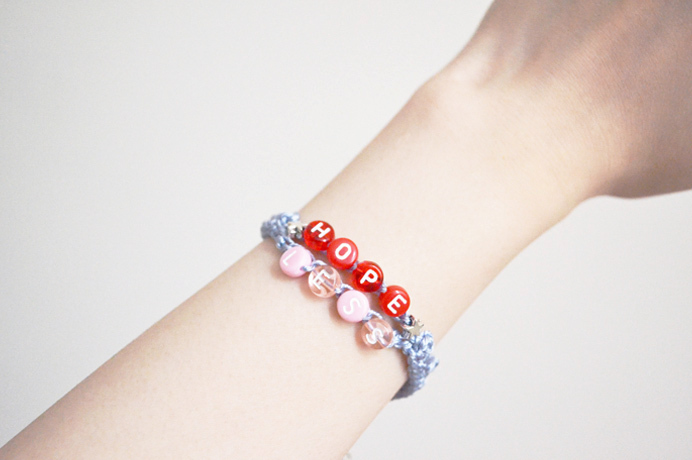 I suppose you would expect words such as “Hope” “Love” “Happiness” etc. 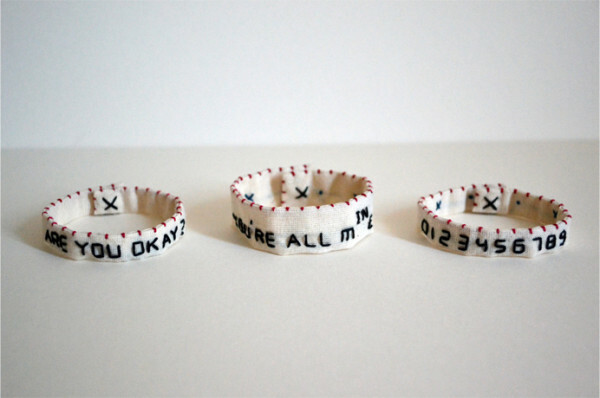 for this kind of jewellery but not with me. 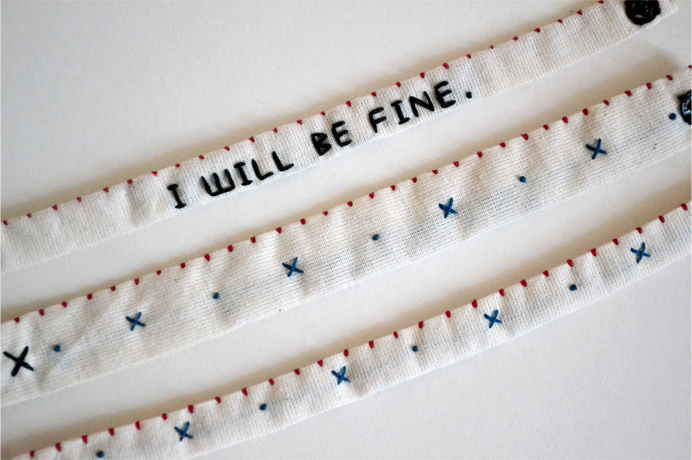 I like my work to sympathise, rather than cheer up forcibly. Hope you like them and be happy! 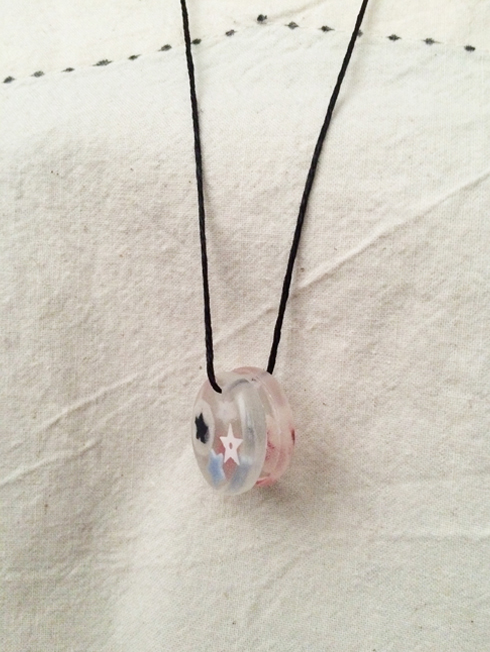 The star-shaped beads are pointing out the first row after all. 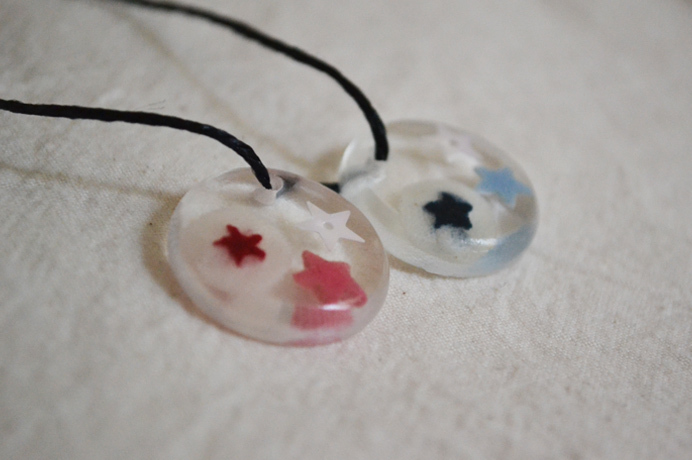 Here are some new trapped embroidery resin jewellery. 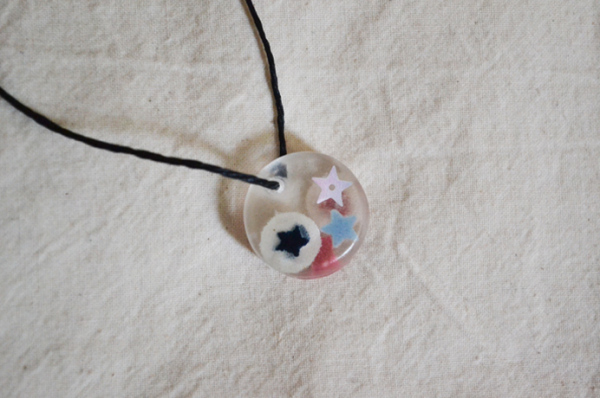 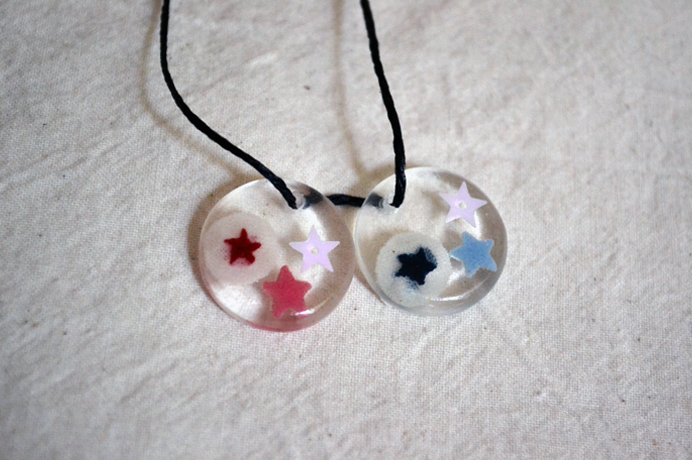 The triple star necklace has two discs with embroidered fabric, confetti stars and sequins inside. I like how the red tone and blue tone can be seen in layers. 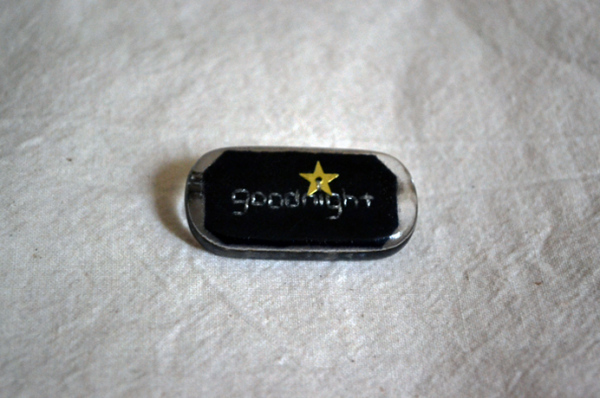 The goodnight brooch has navy felt(looks more black though) embroidered with silver thread and a gold star shaped sequin on the letter “i”. 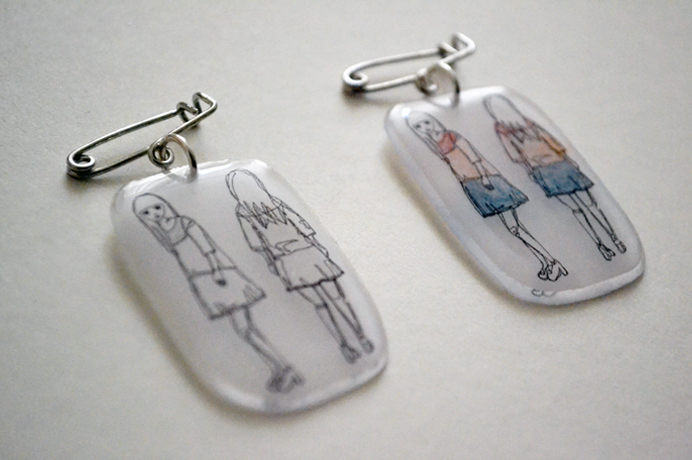 I make a lot of resin jewellery with embroidered fabric inside but these are with illustration printed on paper. 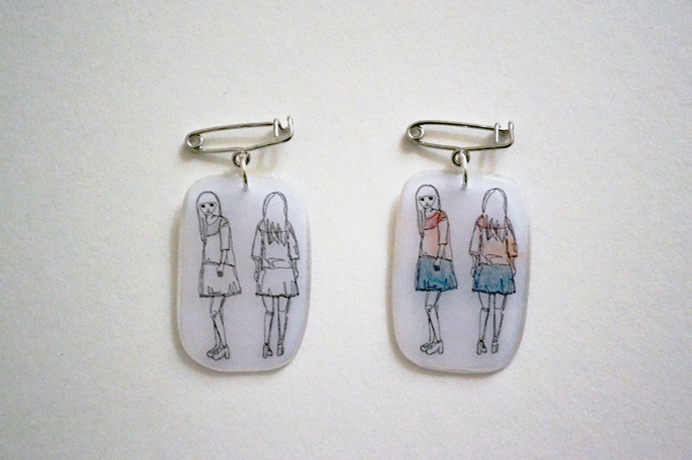 I coloured some of them with coloured pencils individually. 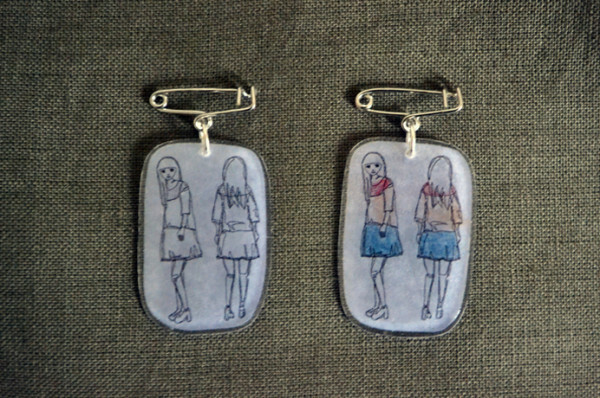 I liked the transparency of the paper so I decided to make them into hanging brooches using looped safety pins instead of using typical brooch backs. 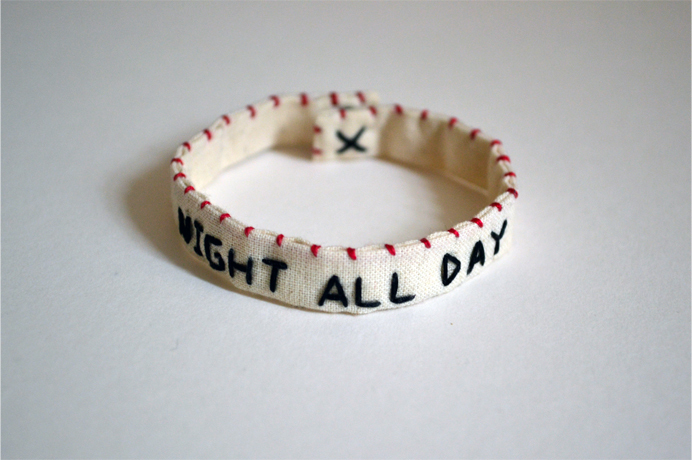 The illustration I used is that of the Amusing Girl’s look of “minus the sun, night all day.” collection. 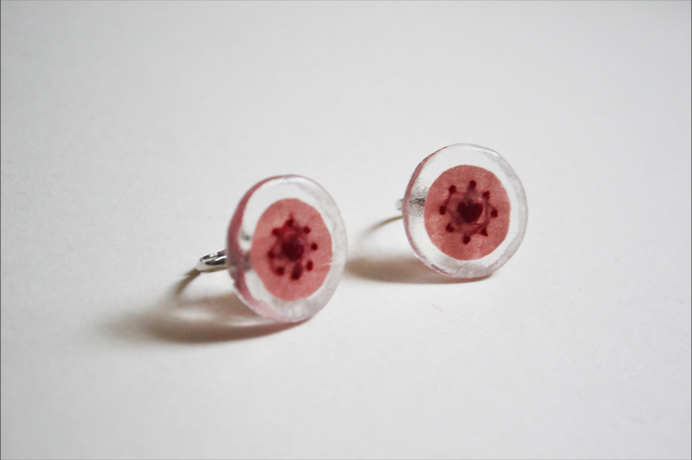 Here are the limited edition resin hair slides and rings for this year’s Valentine’s day. 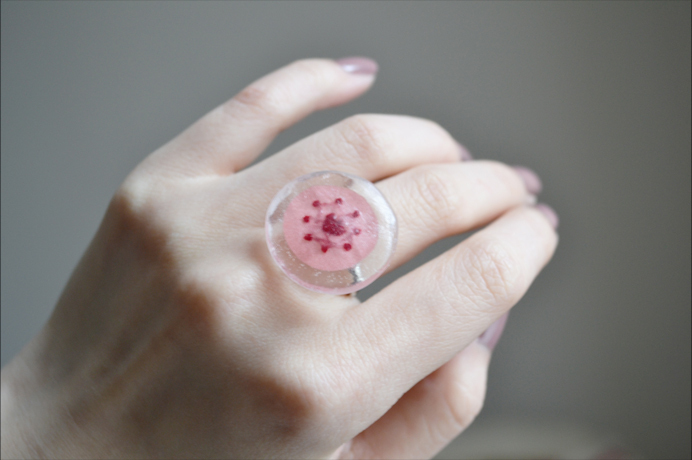 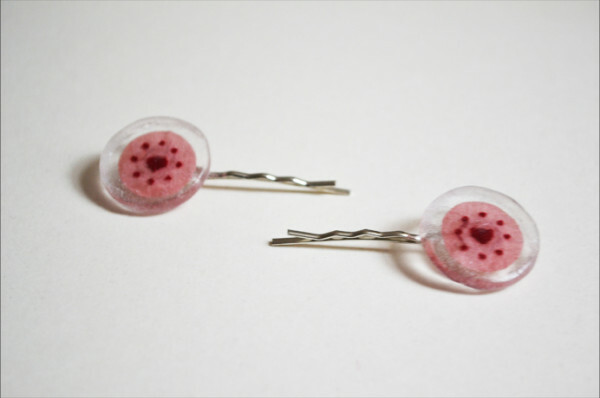 Red hearts and dots are embroidered on pink fabric encased in resin. 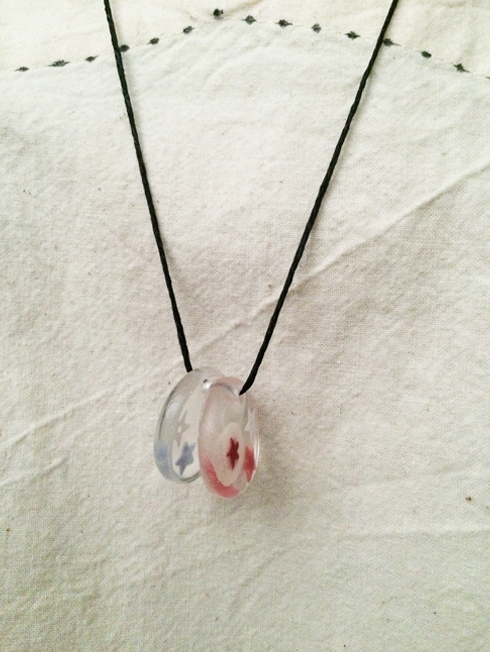 I’ve made one of my popular items in white this time. 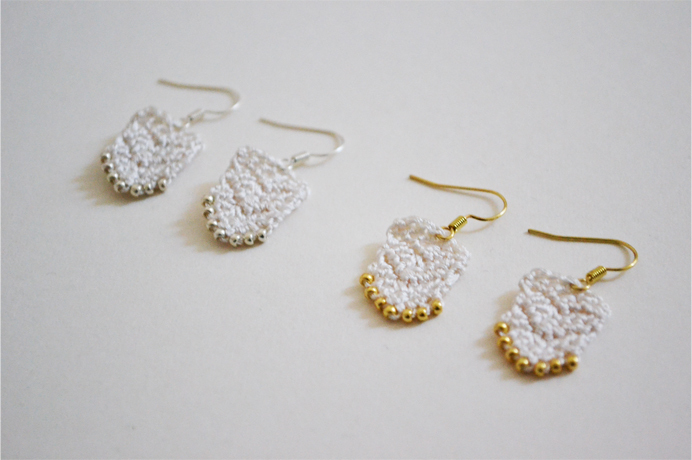 There is a gold beads & hooks version and a silver beads & hooks version. 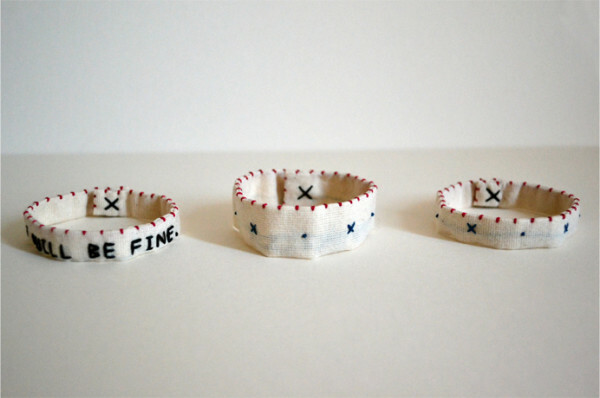 Aren’t they pretty? 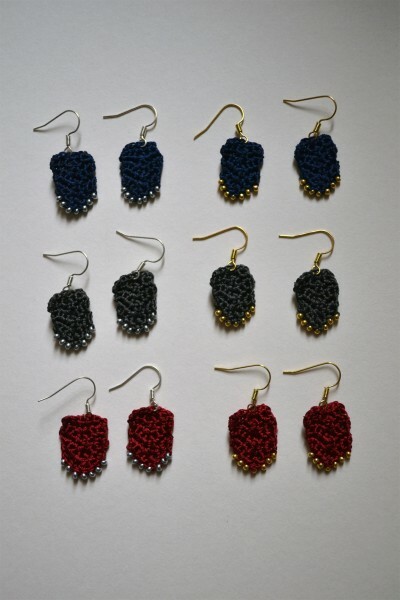 There are red, navy, and grey earrings as well. 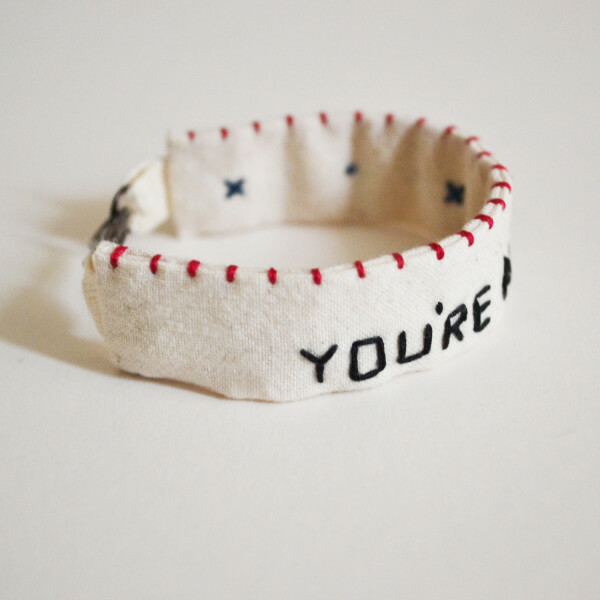 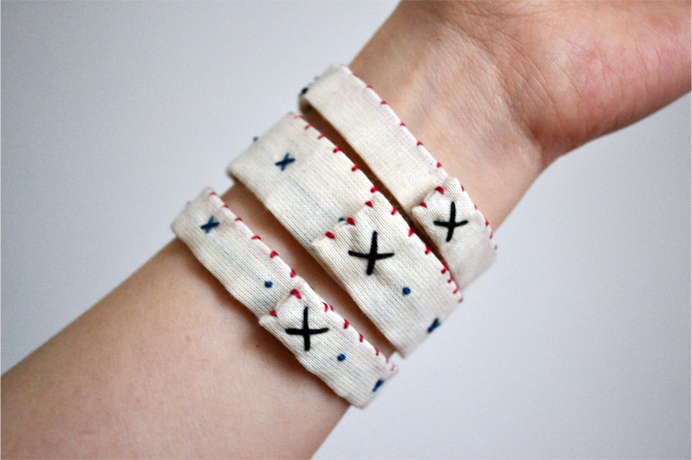 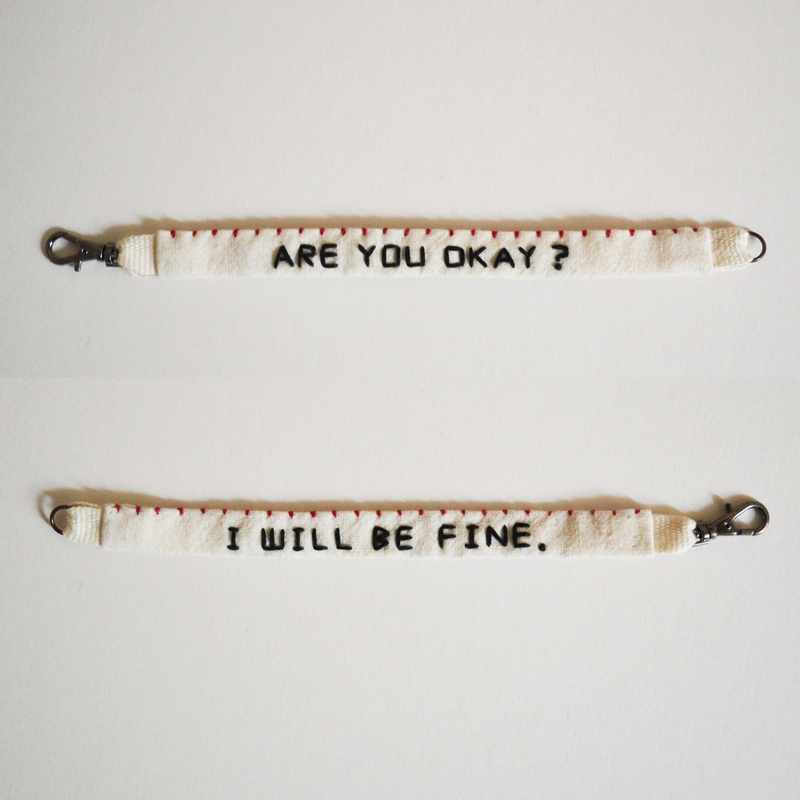 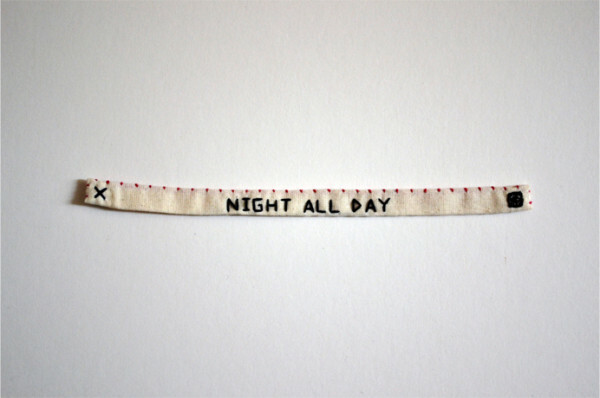 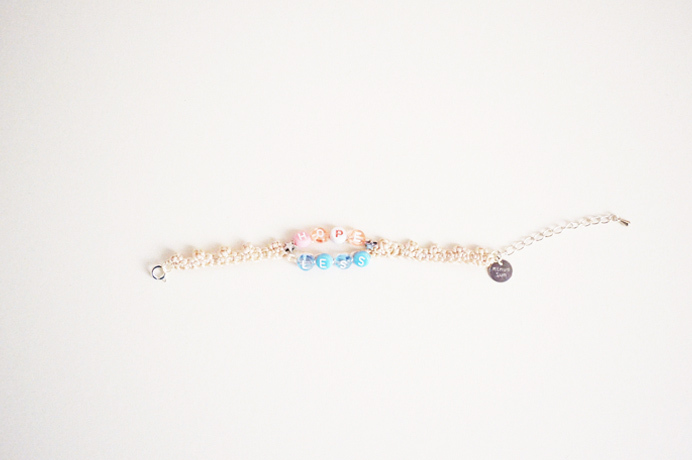 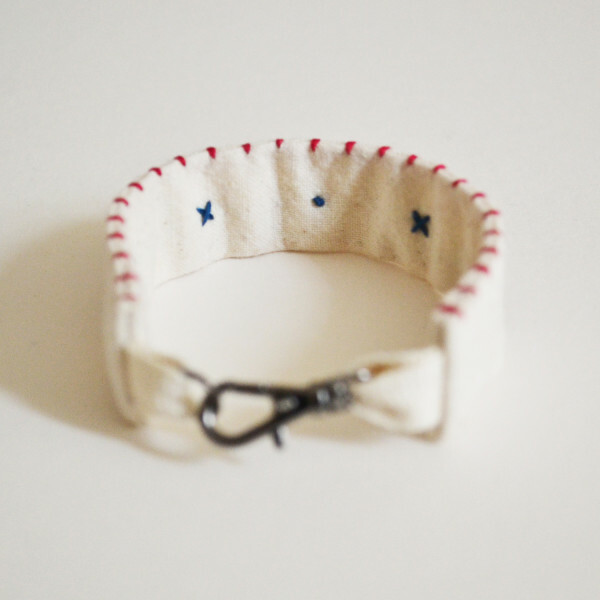 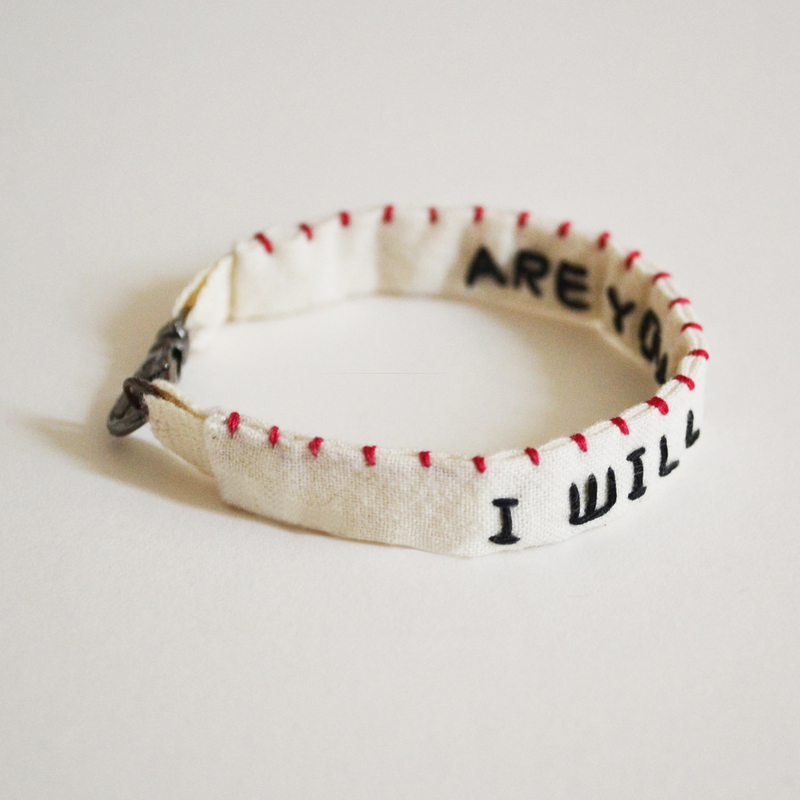 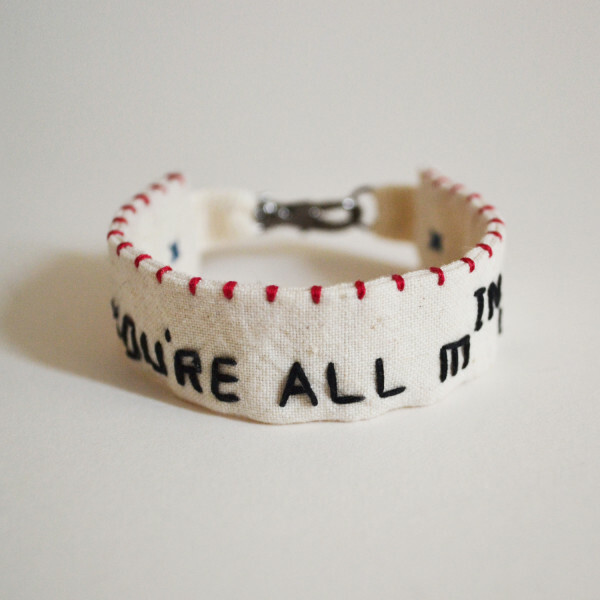 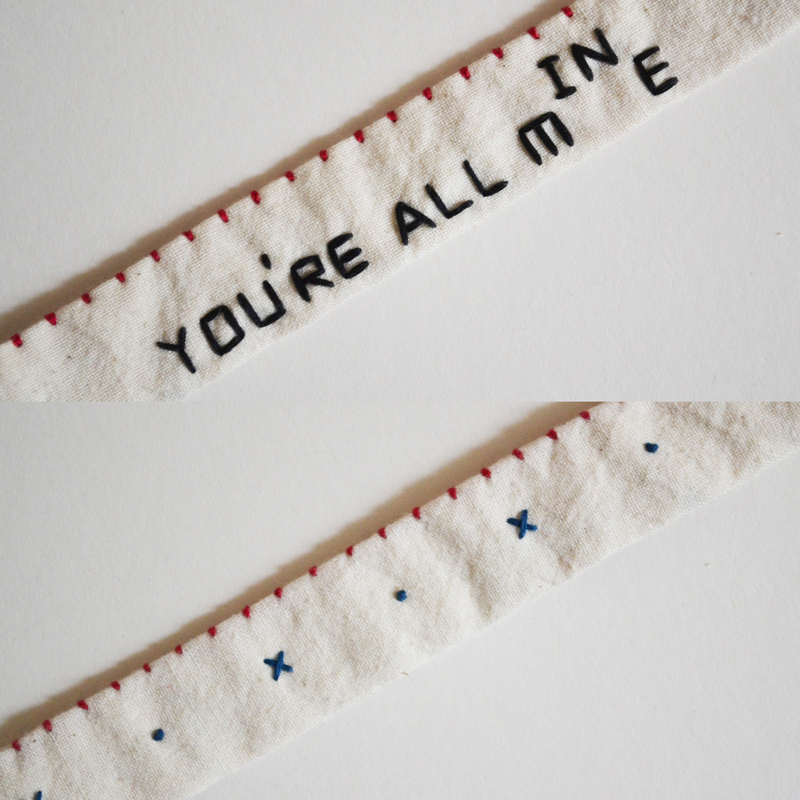 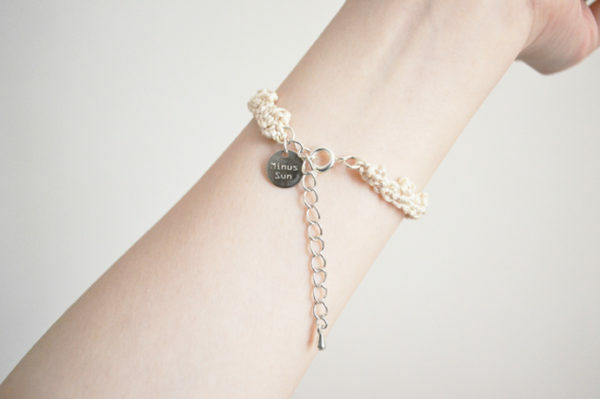 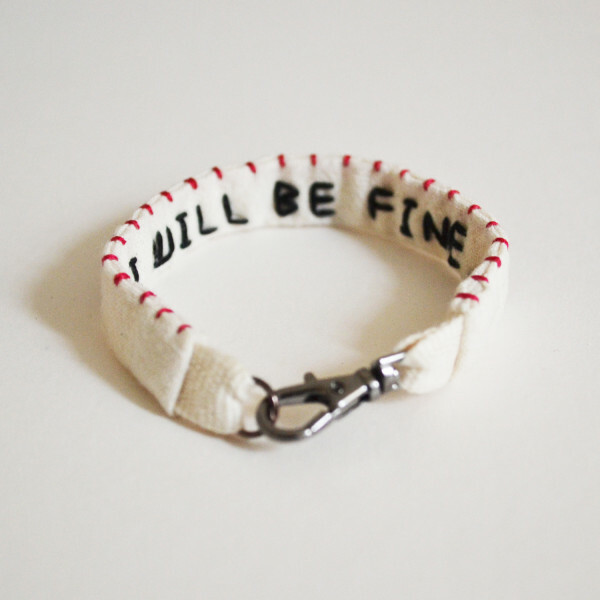 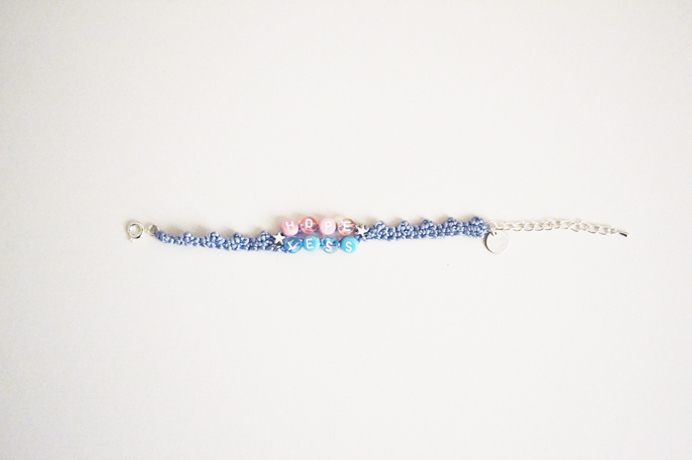 I’ve made a new design for my stitched bracelet range with the title of my 2nd collection. It’s reversible with “MINUS THE SUN” and “NIGHT ALL DAY” stitched on each side. 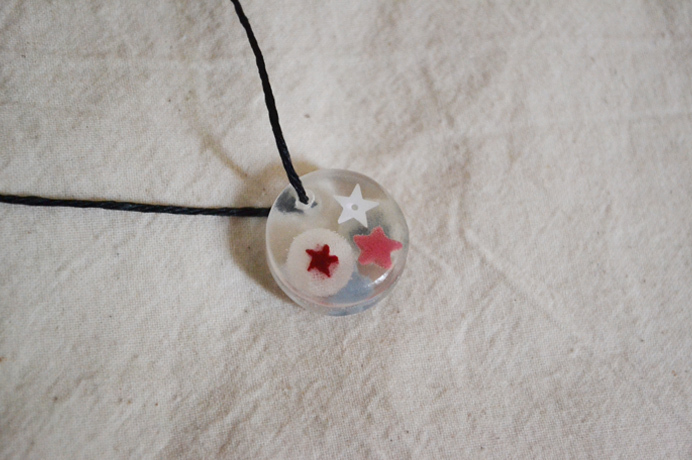 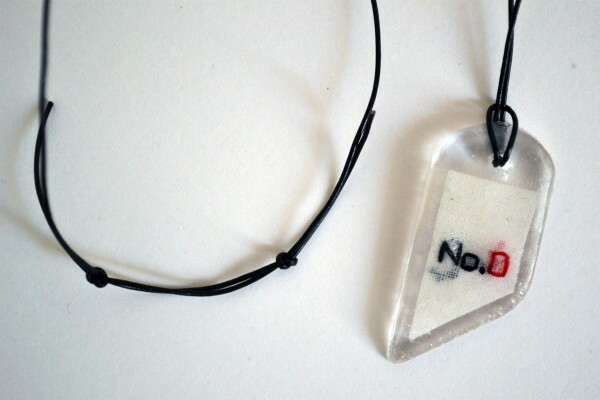 Here is another item to add to my trapped embroidery resin jewellery series. 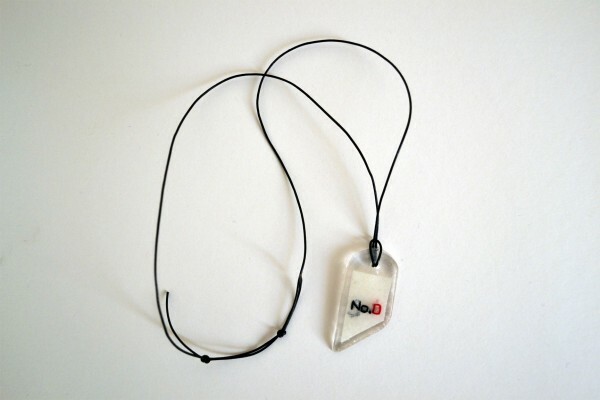 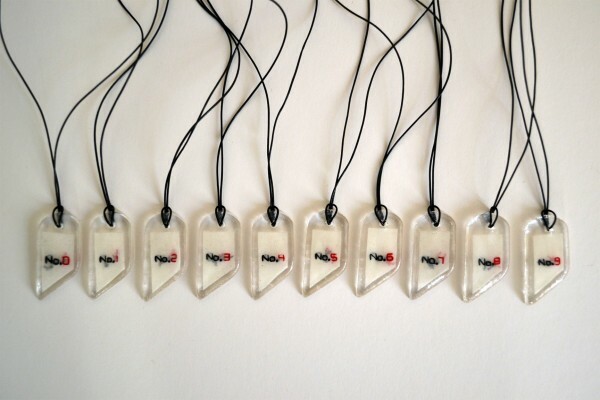 Embroidered pieces of fabric numbered “No.0”-“No.9” are inside flat resin tags with slanted edges. 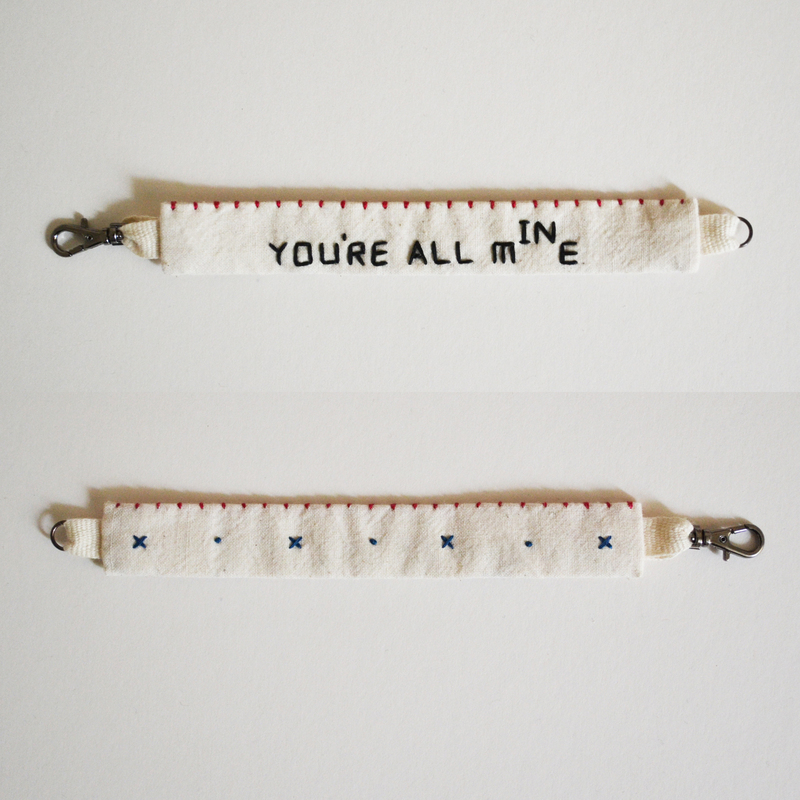 On a black leather string. You can choose a number according to the charaters of Minus Sun or a number you personally like. These are available at Circus, Brixton Village as well as many other works of mine if you’ve missed me at the Selvedge winter fair. 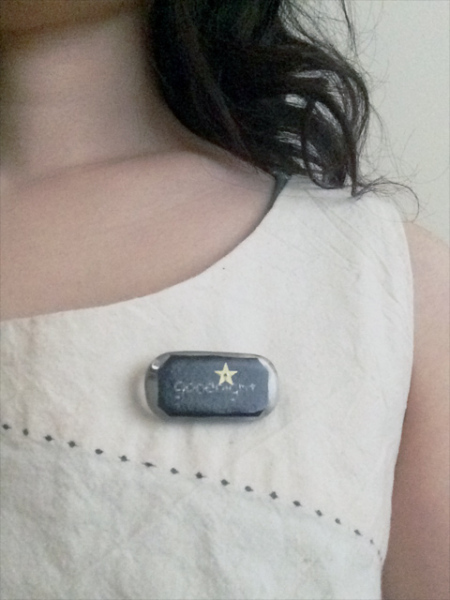 I have been making jewellery and buttons with embroidered pieces of fabric, beads, glitter, and sequins encased in resin for a while now but here are some new buttons with embroidered words. 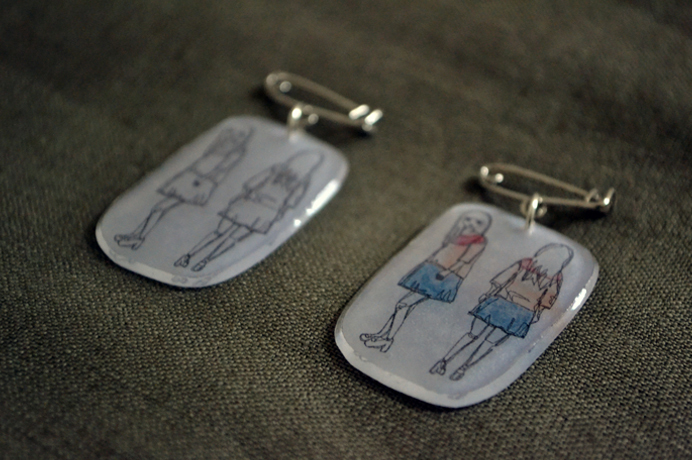 It will be very cool to put them on shirts and cardigans but attractive enough just to have them and keep them. 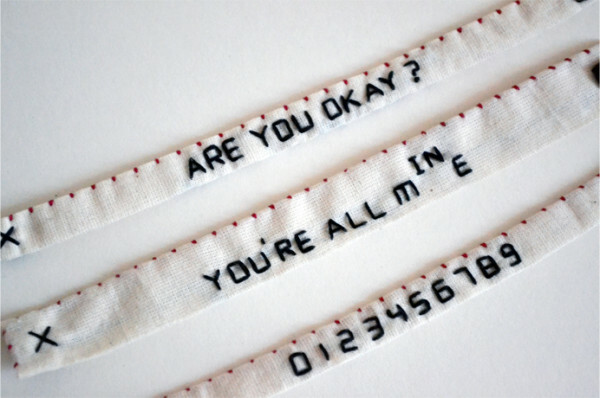 You may have known already but I have a fetish about numbers. 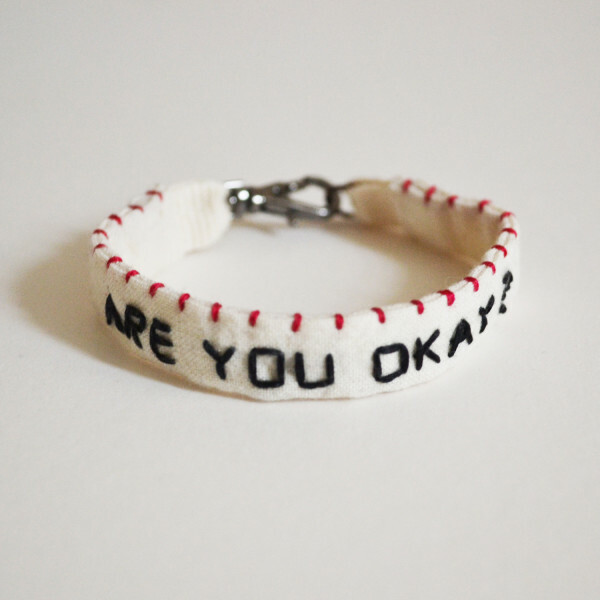 Hello, I am still alive. 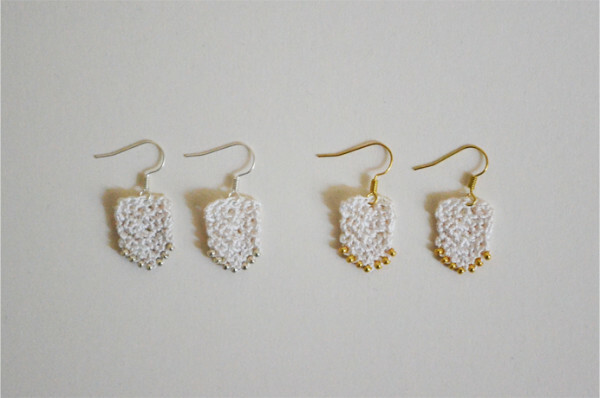 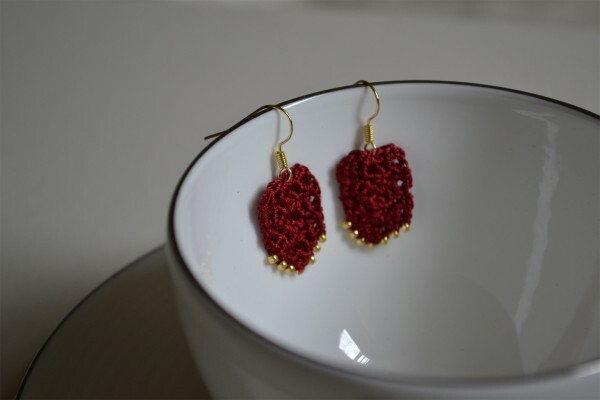 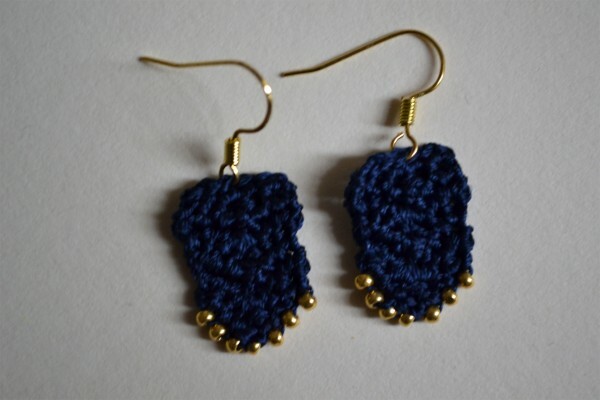 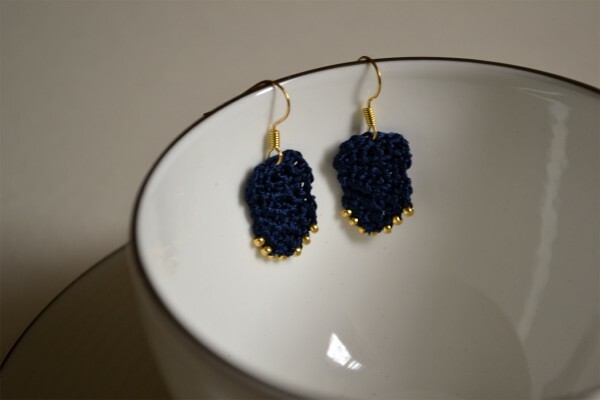 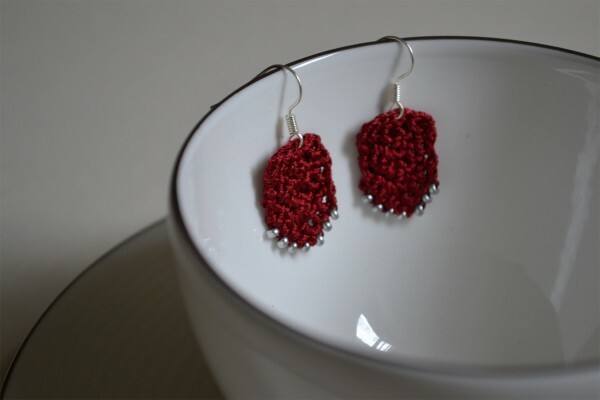 Have a look at the new earrings I’ve made. 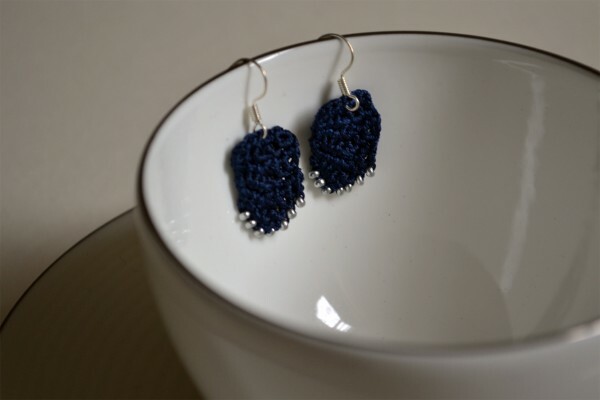 Simple crocheted lace with an angle at the edge with beads. 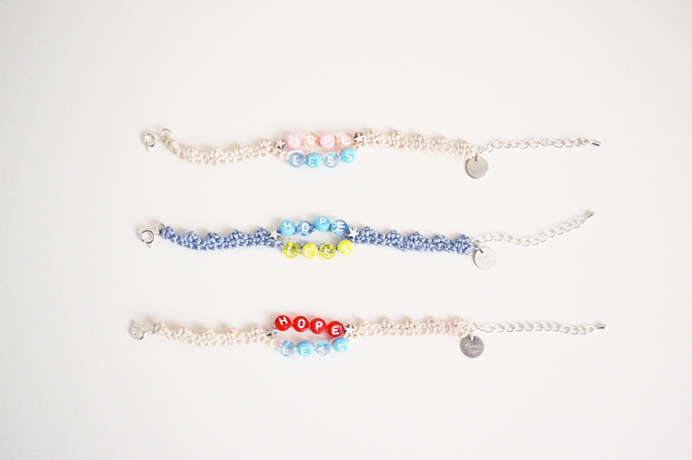 There are three colours so far, grey/navy/red in two versions, silver and gold.